Jesse Santos helps paint the Wall Street mural. Erin Mielcarek and Ellen Picken got a lot of visitors while they worked. Most just wanted to know what the two were doing at the Wall Street underpass in downtown Spokane. Mielcarek and Picken were one of four teams selected by the Spokane Arts Fund to paint murals on the walls of four selected underpasses in the downtown area. 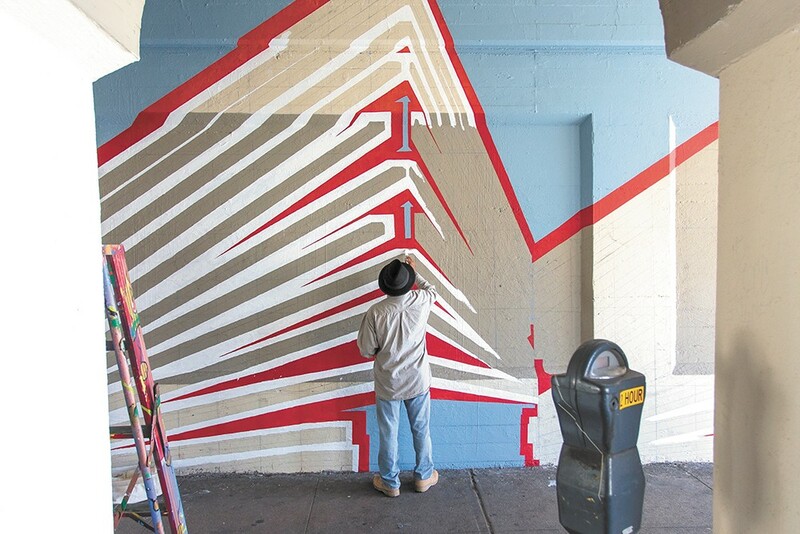 Their conceptual mural, a brightly colored collection of lines, is meant to represent the trains that pass overhead. "It represents the sound and energy of the train as it goes from city to city," says Mielcarek, 33, who met Picken, 34, when the two were in an art show together at the Chase Gallery last fall. Their ambitious plan resulted in vibrant paintings on both sides of the underpass, as well as the pillars. The goal is to brighten the stretch of Wall Street that's currently anything but. "Taggers or graffiti artists aren't going to tag a detailed design," says Shannon Halberstadt, executive director of Spokane Arts. But she's quick to remind that this isn't just a crime determent. "What's even more valuable is that they really brighten spaces and allow for an unexpected art moment for the passerby, and a great way to reflect our culture through art," she says. The Spokane Mural Project provides artists with all the supplies and paint (much of which is donated by supporters like Miller Paint), as well as a stipend. Halberstadt also sees the program as a way for the public to see the community's artists at work. Those folks continually asking Mielcarek and Picken what they're doing? That was also a positive part of the process.